Can someone tell me where weekends actually go?! Whether I pack in loads or just take it easy, it always seems to fly by and before I know it, it’s Monday again. What I really want to do is one weekend just lock all the doors, switch off the phones, stay in my pj’s with the boys and literally chill ALL weekend. 19:30 – Fridge cake made with Samuel & Fred (forgot to take during photos for Insta #sillymummy), then Samuel put to bed with drink. 20:00 – Homework done with Henry, Another drink for Samuel. 21:00 – Tea cooked for Matt & I, Henry & Freddie to bed. Anyhoo who fancies checking out my easy Fridge Cake recipe? Line a 20cm shallow, square-shaped tin with cling film (leaving extra hanging over the sides). 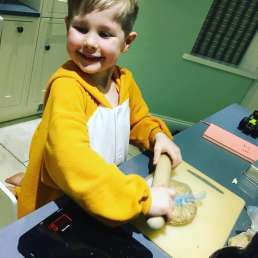 Put the digestives into a sealable freezer bag, then happily bash the biscuits into pieces using a rolling pin (perfect job for a little one). 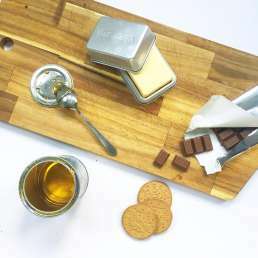 Melt the chocolate, butter and golden syrup in a bowl set over a pan of simmering water, stirring occasionally. Remove the bowl from the heat and immediately stir in the broken biscuits, and any extra ingredients you fancy adding – see below for ideas. Spoon the mixture into the tin. Press down with a wooden spoon to level. Once cooled, put the tin in the fridge for 1-2 hours to set. Turn out the cake by turning upside down onto board/plate. Peel off the cling film and cut the cake into squares and enjoy! 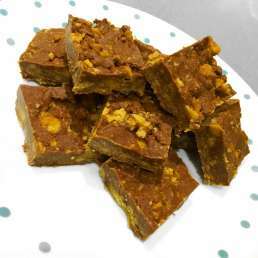 P.S Check out some of my previous recipes for even more ideas including Chocolate Biscotti and my personal favourite Chocolate Cornflake Cake.